Would you like some *new* and *free* documents to help with planning and the assessment of Listening and Talking? Of course you would! Well, I have created the following that might be useful in your school to provide consistency in teaching, learning and record-keeping. If you are already a Reflective Reading school they will dovetail nicely with your existing documents. QUICK! Give me the Listening and Talking stuff now! These documents have been created to assist with evaluating, planning, tracking and assessing Listening and Talking. They are designed to be used in conjunction with the Reflective Reading materials, in particular, the CfE Reading Tracker and the Child Friendly Assessment Booklets. Written with reference to the Experiences and Outcomes, as well as the ‘Significant Aspects of Learning’ in Listening and Talking, the documents should help ensure teachers are familiar with the requirements set out in Curriculum for Excellence. Within Literacy and English there is a natural overlap between the skills of Reading, Writing, Listening and Talking. Teachers using reading approaches (such as Reflective Reading) which involve group work with a focus on discussion, as well as the higher order thinking skills, will find that they are automatically addressing many of the Experiences and Outcomes for Listening and Talking in their day to day planning, teaching and learning. Special consideration must be given however to the organiser ‘Creating texts’ to ensure that children are given ample, varied and relevant opportunities to plan, write and participate in group discussions / debates and solo talks or presentations, in a variety of curricular areas. For this reason, the two observational assessment sheets that are provided, the Group Discussion Assessment and the Solo Talk Assessment are the same for every level. It will be for the teacher to decide, using their professional judgement, if a particular statement can be given a tick, dot or a cross. N.B. some statements may not apply depending on the context—these can simply be marked with a dash—or ‘n/a’ (not applicable). 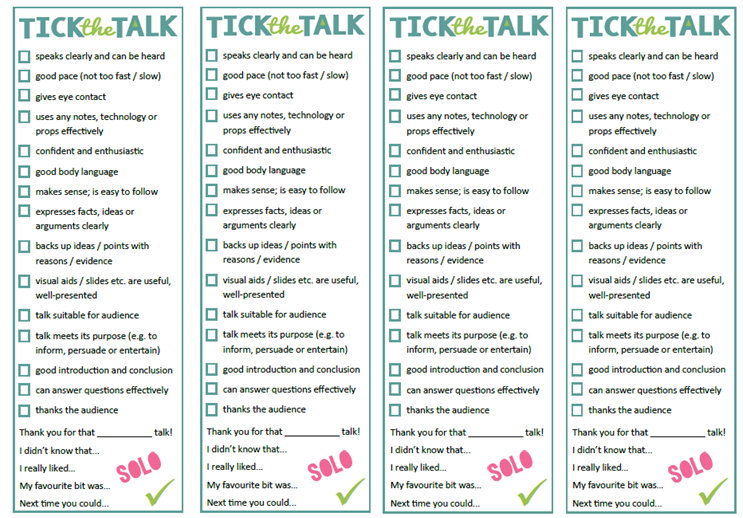 In this way, the same assessment sheet can be used whether listening to a ‘Show and Tell’ style talk in P1, right up to a Dragons’ Den style presentation in the upper stages. This will help provide consistency across the school and ensure that all teachers share a common language about Listening and Talking. The sheets are not designed to be used to attribute marks or levels to individual children, rather, they should be used to highlight strengths and points for development at an individual level, as well as whole class level. It is recommended that at least four assessments are carried out per session, ideally one each term. These should involve group discussion / debates as well as solo talks or presentations and should ensure variety in terms of purpose (to inform, persuade, entertain etc. ), audience (group, own class, younger class, whole-school, parents, invited guests etc. ), curricular area, subject matter and format (use of technology / formal or informal situation). Now I'm ready! Give me the stuff!